To be frank, I am not really into shopping as I have been too many shopping outlets everytime I travel. But since Las Rozas Village Shopping is located on the way to Segovia so we have a 2 hours stop here. Las Rozas Village shopping is about half an hour from the city of Madrid. We arrived here before 10 am and the shops only open from 10 am and some even at 11 am. The first thing you do when you arrived at Las Rozas Village is to go to the information center and get the VIP discount card, which will give you a 10% discount. Not all the designer outlets participate in this VIP discount cards, only for the selected brands. Having said that, most outlets still offer up to a 70 % discount. It shall not be valid when additional discount campaigns are on offer. (Plenty of terms & conditions to use this VIP discount card. ) There is no queue to wait for the VIP discount card so just go in and get one as you never know you may need it. Las Rozas Village is one of the best outlets in Madrid area, it big, over 100 outlets but still no bigger than the one in the Cabazon & Desert Hills Premium outlets @ Palm Spring California USA. Probably, one-third of the size of the American. The layout of the shipping area is similar to the designer outlets in America which adopt the outdoor outlet village, meaning in the Outlet, you walk outside between shops. All the outlets do not sit in one high rise shopping complex. Since it is still early in the morning, most shops are not open yet but you can see there is already eager shoppers standing outside the shop to wait for the door open. Most of the famous international designer brands are here, such as Coach, Gucci, Prada, Michael Kors, Dolce & Gabbana and many more Spanish and International Brand. I was admiring at the big yellow maple leaves some plants at the sitting area. There are tapas restaurants & cafes in Las Rozas Village. For the spouse who does not like to shop, they can wait at the Starbucks Coffee. There are plenty of open-air outdoor seatings too. Some of the Spanish famous brands you may want to know are Bimba y Lola, LOEWE, Adolfo Dominguez etc. Tous is a Spanish, specialize for jewelry, accessories, and fashion (see below). After the commercial incident in China, there are still plenty of Asian visiting Dolce & Gabbana which make me quite surprised. Probably there are not Chinese from mainland China. GEOX is from Italy and most of their shoes are made from leather. They are huge ranges to choose from, a different type of leather, colors, and design. I was looking for a pair of below knee high boots and glad to found one in black which has my size. This is the pair I got at 79.10 euro after a 50% discount before tax refund. I still able to get some money back from the airport when I do the tax refund. The total I paid for this pair of boots is about 70 euro after tax refund. Interestingly, this American brand is full of customers. There is only up to 50% discount which I think it isn’t that cheap as compared to the coach outlet in America. But still a lot cheaper if you are buying from Singapore. Things they sell in Coach here are different from the USA. 89 Euro after discount from original price of 350 euro for these little purses. I find them quite expensive or do I look wrongly at the price? Coach petite haversack cost 289 euro from original price 450 euro. This is pretty cute I find with the golden touch, very shiny and chic. Coach bomber jacket cost 449 euro and when I touched the material, it’s pretty thick but quite heavy. This range of Coach haversack has few different colors. Which one is your favorite? I find the sky blue pretty cute. Christmas decoration can be seen throughout the outlet village. After an hour when the shops open, you see visitors started coming to the village to shop. The origin is from Australia and made with twin-faced sheepskin with fleece on the inside. The colorful stars print are for kids. I love this pair of boots as it made me think of my dog’s hair, also in white. He is a Japanese spitz dog. To be frank, I don’t really fit to review Gucci as I don’t even “dare” to step into their shop. The price is high and I do not see any discount label (which I don’t think Gucci usually slash down their price). I was just taking some pictures from the outside. I do love their interesting prints on the bags though. After two hours of shopping we went to the car park and was quite shocked at spaces of the parking lots are no longer vacant like in the early hours. If you are in Madrid and love designer stuff, then coming to Las Rozas Village would be the right choice for you. This is paradise for shoppers and great saving too. Do remember to inform the shop that you need to do a tax refund, they will help you to input your details from your passport into their computer and then give you the document to hand in the airport. At the airport, I usually like to get cash back rather than asking the tax refund to be charged back to my credit card. The instant cash back would be slightly lesser but at least I am sure I have gotten my money on hand before I fly out of this country. The charging back to my credit card does have some risk of not getting my tax refund back in case something went wrong and there is very little that I can do as I am already at the other end of the world. The highway view near Las Rozas Village. Wow that looks like a fun time. I have never been into shopping here but maybe I need to step it up and do it there. I have never been to Madrid but it is definitely on my bucket list to go. I’ll have to stop here and shop around, I love a lot of the brands that you mentioned. Thanks for sharing! This looks like the perfect place to do some shopping while in Madrid. I could do some serious damage at Dolce & Gabbana. Looks like a great place to visit when visiting Madrid! So much choice! What a cool place to check out. How neat that there are so many shops to visit! Looks like a lot of interesting products too. Those furry boots are wild! This is quite the shopping experience! If I ever visit Madrid, I’ll have to stop by there; this looks like shopping centers we have here in California, but this is much more high end indeed! I am heading to Madrid in September. I will definitely put this on my must-do list. Looks like a great place to visit when visiting Madrid! i would go crazy there. I love outlets and those kids uggs are so adorable. Glad you like Barcelona and I totally agree with you that Spain is so beautiful with stunning architectures. I was flying from Barcelona back home but my stay in Barcelona is quite short and there are so many things that I did not see yet. I was planning to visit Madrid, I think this is the place I need to check out too! Interesting. I love the quaint little shopping area. It looks cozy. I’ve always wanted to go to Madrid. Maybe one day. What great places to shop in Madrid. We love outlet shopping anywhere. The outlet is just half an hour drive from Madrid and offers great saving if you are looking for designer stuff. Great outdoor outlet to shop at! I like indoors but outdoors are fun too. That shoe at the first photo, I thought it was someone’s hair lol. What a fabulous section of the city! The stores are beautiful and look like so much fun. It sounds like you had fun strolling and shopping at that place. That was a huge discount for that bag. Great deal! Such a fun and great experience you had. Those were my favorite brand, especially Pandora. Glad that you were be able to roam around Madrid. I know there are people who love to collect Pandora items from around the world. Also Pandora make a great gift as it is so light to bring. Looks like a fun place to shop! Love those boots. it looks like a great place to walk around and shop! love the boots too! I totally agree with the idea of window shopping and then a cafe or tapas lunch. That would made me very happy already. Ooooo now this looks like my kind of place!!! So many awesome shops to check out!!! The outlet layout is similar to the one in USA, outdoor and you walk outside between shops. The price of the boots are quite good and I have bought a pair of leather boot for myself. What a great place in Madrid to see so much. You really had me at tapas though, AND Pandora! 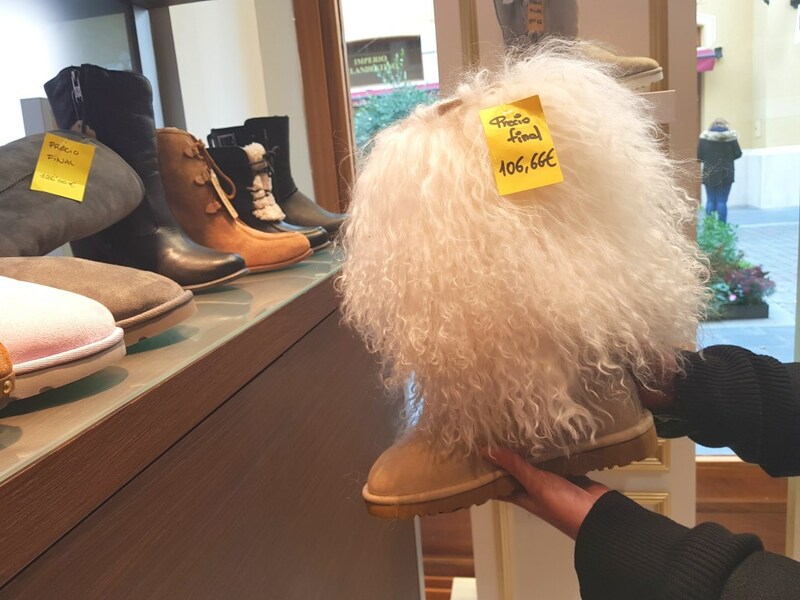 If you are not sure where to shop in Madrid, then coming down to Las Rozas Village ( just 30 mins away from Madrid city ) is not a bad idea, as it has so many discounted items with top designer brands. I love to shop, so I think that I would love this place. Adding to my travel bucket list!